Nothing But Creative: Will ZiiLABS' Jaguar3 finally save Creative? Will ZiiLABS' Jaguar3 finally save Creative? 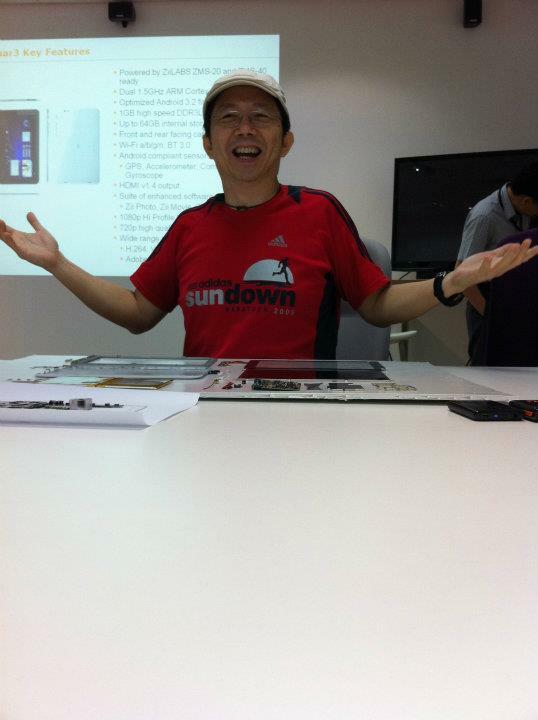 It has been years since Mr. Sim Wong Hoo appeared at any of Creative's press event. But at the recent ZiiLABS' Jaguar3 closed doors press event in Singapore, Sim appeared with a clear message: "I'm here today because I want to tell our shareholders and to lift the morale of our employees that we are leading in the game." The message couldn't have come at a better time. Creative's stock had fallen to an all time low of $2.4 a few months ago and was recently put on the watch list of the Singapore Exchange for having 3 consecutive years of pre-tax losses. The company has been struggling to stay in the black from quarter to quarter. The demand for Sound Blaster products have been decreasing as people are switching to on-board audio, its portable media players are under intense competition against the Apple's iPod while adoption for the company's wireless speakers are not picking up as fast as one would wish for. 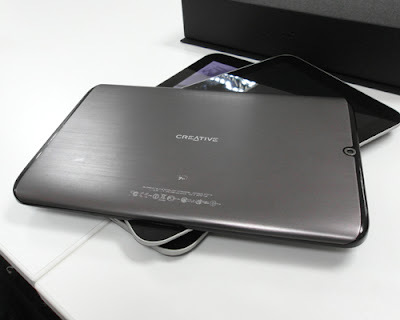 The shining beacon of hope for Creative, is the company's subsidiary ZiiLABS' Android reference tablet codenamed the Jagaur3 . Boasting one of the world's thinnest reference tablet design (that is if your remove all the frills), the Jagaur3 is powered by the ZiiLABS' ZMS-20 stemcell processor and has a 10.1' capacitive touchscreen and Android 3.2. 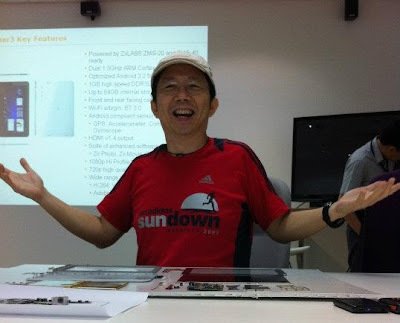 OEM customers can also choose to upgrade the chip to a more powerful ZMS-40 quad-core processor simply by swapping the chip into the "granddaughter board". The most basic tablet could just cost U$100 to make. Shedding more light on ZiiLABS' strategy, Sim revealed that the company has about 100 patents which was developed with the Jaguar3. Furthermore, Creative is now one of Google's approved vendor and has access to the source code to Android 3.2 OS - something which they did not have when developing the ZiiO. "We know how the technology works, we can build future iterations of Android very quickly now," Sim said. Sim believes that "The gold mine is coming. We're nearly there," and he does have a valid reason for such optimism. The tablet market is growing at an unprecedented rate and there is certainly a market for low-end, high quality tablets as seen from the recent TouchPad $99 fire sale. If ZiiLABS can produce a worthy Android 3.x tablet at a sub-$200 price point, it certainly has a winner on hand. Most tablets in the market now are priced ridiculously close to the Apple's iPad and have little differentiating factor. To put it simply, when you place all the Android tablets together, you can hardly tell one from the other. Instead of going head-on with the iPad, ZiiLABS' strategy of empowering companies to produce tablets at at least a third of the price could be its winning formula. Also, Sim's vision of transforming the landscape of education (at least in China) by digitizing textbook into an Android-friendly format onto an affordable tablet (or a highly subsidized one by the government) could give it a foothold in the tablet market. But admittedly, Creative faces a long, uphill battle to say the least. In a market dominated by major players like Intel, AMD and Nvidia, ZiiLABS is relatively unheard of. Also, with the lack of an actual, successful shipping product, companies are understandably wary of the company's capability. Sim also did specifically mention that the Jaguar3 is "real" and "it's working", probably referring to the company's previous unsuccessful product - the ZiiEGG. While I feel that it's good that ZiiLABS is focus on the OEM market instead of taking the big boys head-on, Creative as the parent company should lead by example and produce the company's first ZMS-20 powered Android 3.x tablet. To put it in Sim's own words, the "tablet market is pure ruthless in every sense", where even "a fast-track 6-month design cycle can still be lethal". Therefore, it would make sense of the company to produce a worthy and affordable Android tablet while the ZMS-20 is still considered an advanced processor than to wait for companies to adopt the platform. Below are some of the demo videos of the Jaguar3 platform, honestly it does look promising.